If there's one element I enjoy in romances it's a reunion between married characters. I figured the amnesia plot of HER FALLEN PROTECTOR would make that reunion very complicated and therefore rich in plot but really only the former was true. This book was so complicated and between all the names both the hero and heroine had I was quickly put off by how needlessly complex it all got. I usually defend and get excited over angel and demon mythologies in paranormal romance but this is the first time I found myself heavily questioning the logic on how some of the elements were played. Making it worse was that outside of some steamy love scenes there's zero chemistry between Jacob and Vdarra. The conflict between them that keeps them apart felt contrived. I hate giving 1 star reviews but this was one of the small handful of books that made me break my finish-every-book-you-start guidelines. Instead of DNF-ing it I skimmed the last quarter of it just hoping for something to spark. It didn't. 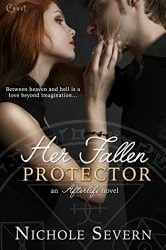 Perhaps if you're more in the mood for an Urban Fantasy than a romance you might enjoy this one. I just couldn't find anything that I liked about it. Chances are I'll give Severn another shot, I did see great potential here, I just didn't find it suitable as a category PNR title.